To control and use HEBI hardware we provide Applications and APIs that run on a wide variety of operating systems. Apps include GUIs that provide a user-friendly interface for things like viewing feedback, configuring modules, or getting feedback from other devices. APIs allow you to write programs in different languages that interface with HEBI hardware. All of these apps and APIs can be found in the Downloads section. A GUI for doing basic tasks on modules like visualizing feedback in real-time, manually sending commands, setting name/family, configuring controller, tuning gains, and updating firmware. A mobile app that provides basic user input on a touch screen and provides easy access to a number of internal sensors from the mobile device. The app provides on-screen buttons and sliders for sending digital and analog inputs, mirroring the physical capabilities of the HEBI I/O Board, that can be read in the various APIs, including a layout that acts as a joystick. The Matlab API is a released API that runs in the standard Matlab working environment with no additional add-ons or toolboxes. The Python API is in a beta testing stage. It is available at https://pypi.python.org/pypi/hebi-py. The C++ API is a released API that is provided as source code wrapping a C library to guarantee maximum portability across compilers, platforms, and operating systems. We provide multiple ways of interfacing with HEBI components using ROS. More documentation is available on the ROS wiki at http://wiki.ros.org/hebiros and http://wiki.ros.org/hebi_cpp_api. The C# API is in a beta testing stage, and will be released on the NuGet package management system. A low-level API that is generally not intended for direct use. A format for saving and loading all the control parameters for the onboard controllers for individual modules, as well as groups of modules. A format that allows saving and loading of the kinematics and dynamics information about a robot configuration. 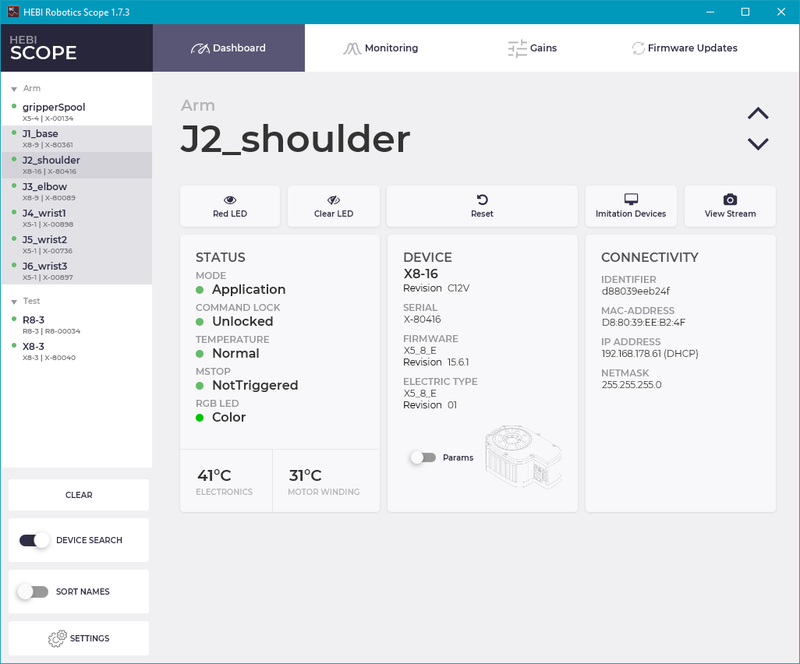 Scope is a cross-platform graphical user interface (GUI) tool that provides configuration, monitoring, and testing capabilities for HEBI actuators and modules. We recommend using Scope at all stages of your development, partiularly its plotting and logging capabilities. Before writing a new program Scope is useful to make sure that all devices are connected properly and that the system as a whole is working as expected. While developing and debugging a new application Scope is extremely useful for viewing the feedback and tuning gains on the live system. Download the latest Release for your OS. Make sure all modules are powered on and connected to your local network. Start the application by double-clicking. The Device Panel that shows all devices visible on the network interface. 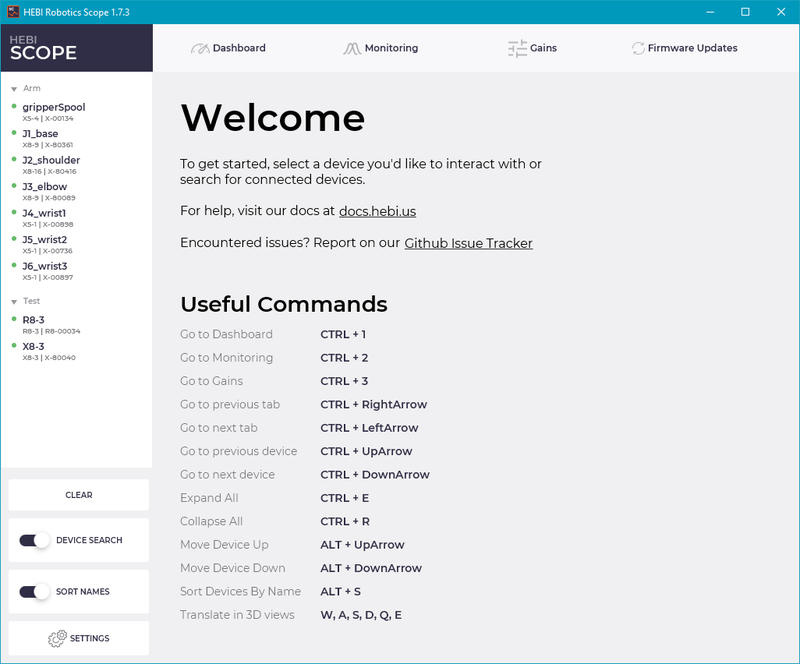 Dashboard shows general device information such as hardware revisions and Ethernet settings, as well as various states. Monitoring provides plots of device feedback as well as manual inputs for position, velocity, and effort. Gains sets control strategies, gains, and safety limits. Firmware Updates allows to safely update device firmware. A toggle to enable or disable the device lookup. Disabling will reduce network traffic, but it will keep the individual GUI elements from being updated. A toggle enable or disable the display of additional hardware type and serial number information next to each device in the Device Panel. A button that brings up a dialog with additional settings. A slider for controlling the rate of device search (background lookup) requests. This also represents the rate at which the GUI feedback elements will be updated. Typically, this value should be between 5 - 10 Hz. A drop-down for selecting the active network interface. For example, if your computer is on a separate wired and wireless network, you can select which network to show in the in the Device Panel. You can show all connected networks by selecting 'ALL'. If a network connection is connected or disconnected you can update the drop-down items by clicking the Refresh button. A toggle to disable hardware acceleration. This may be required on certain versions of Linux (such as Ubuntu 16.04. without the latest updates) to prevent a memory leak in the native Mesa 3D drivers. The changes will be applied on the next start of the application. The Device Panel shows all devices that are visible, or were recently visible, on the network. The main action in the panel is to select one or more devices for interaction. When multi-selecting, the darker highlighting represents the device that is currently in focus and corresponds to the feedback shown in the tab . You can remove all devices that are not currently on the network (ones represented by a grey dot) by clicking the Clear button . The display can be toggled to show the corresponding hardware types and serial numbers in addition to the settable human readable names . Confirm that the Device Search toggle is enabled . Update the network interfaces by clicking the Refresh button in the Settings Dialog . Confirm that the computer that Scope is running on is on the same network as the devices, and that the computer’s networks settings are properly configured. The Dashboard Tab shows general device information such as hardware revisions and Ethernet settings. The name and family of the currently focused device. Names can be changed by pressing the enter key. Switches the focus to the next or previous device within the selected devices. Darker highlight that represents the focused module. Action buttons for commonly useful options such as setting the LED color to help determine the device’s location on a robot. The Status section provides details of the various states that the device is in. The Device section shows the details of the mechanical electrical components of the module as well as information about the currently running firmware. The mechanical details are permanent and will never change. The Connectivity section shows the MAC Address of the module, which is permanent, as well as network parameters that will depend on the details of your network configuration. Toggles between static address and automatic (DHCP) mode. In static mode, the IP address will stay constant and the device will boot up faster, but if the network changes, the device may become unreachable. 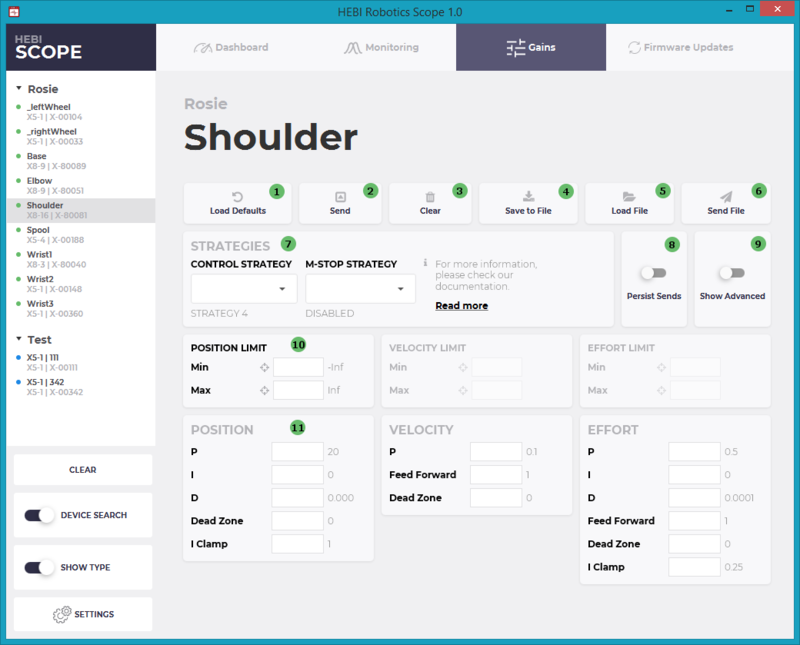 The Monitoring Tab provides a way to plot device feedback and provide basic inputs for position, velocity, and effort. A slider to control Frequency that feedback is requested and plotted from a module. This setting effects all open plots. A button to create a .hebilog file of the feedback of all selected modules. The frequency will match the plotting frequency. Only one log can be active at a time. PPI scaling selectors for better viewing on high-DPI displays. This setting only effects new plots that are opened. Time Window selection for controlling the rolling-window resolution of the x-axis of plots. If you select 'Auto' the x-axis will scale automatically based on the plotting frequency. This setting only effects new plots that are opened. Plotting buttons for viewing online feedback from a module. If you multi-select modules in the Device Tab, a plot will open for each module. The y-axis of the plots is scaled automatically. A legend for the plot is at the bottom of the plot window. A checkbox and slider to send Commands to the selected modules. The initial commands after enabling the slider will be set to the device’s current state. A button for setting manual command Targets to a module. For example, to check the position feedback from a module, select an appropriate device on the left panel, and then click Position plot to view the module’s reported position. Commands can be generated by enabling the Position checkbox and moving the corresponding slider. Alternatively, you can command an exact value using the corresponding target button. If you multi-select modules in the Device Tab, a plot will open for each module. Multiple commands can be active simultaneously. Commands are sent with a command lifetime disabled. This means that commands sent from Scope to a module will stay active until another command is sent, and new commands from any API will immediately override the last command from Scope. If you close Scope, previous commands sent from Scope will still remain active on a module. Unchecking the command slider will clear a given commmand. The slider inputs will not work if someone is actively commanding an actuator with command lifetime enabled. The dashed line represents the commanded position, and the solid line the feedback position. Scope is a completely standalone process with a separate network connection that is independent from any user code, and can be run in parallel with any other application on the same computer or local network. When debugging your applications we highly recommend making use of Scope’s plotting capabilities in order to get live feedback on the behavior of an algorithm. For example, math errors often show up as large spikes or full drop-outs in the commanded line of position, velocity or effort. Plots can be paused and zoomed by left clicking-and-dragging. Right-clicking a plot will resume updates and auto-scaling. 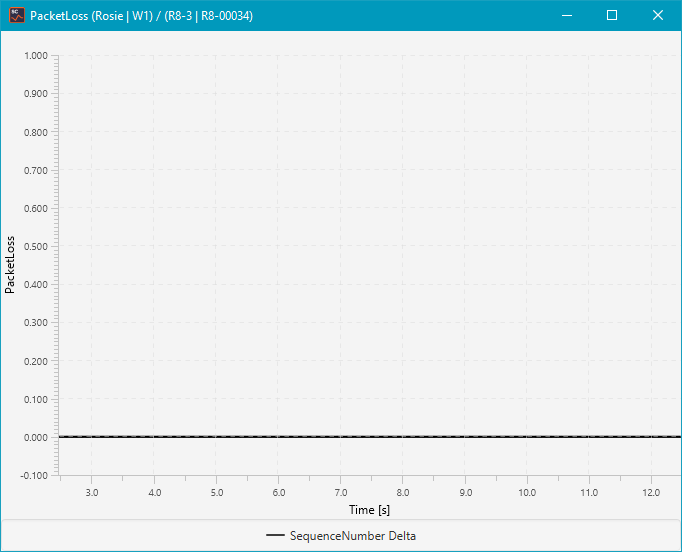 Left-clicking a plot will freeze it, although data may be cleared as feedback updates in the background. To freeze plotting indefinitely, uncheck the box under 'Frequency'. If you want to get an idea of the performance of the underlying network the Latency and Packet loss plots are useful. 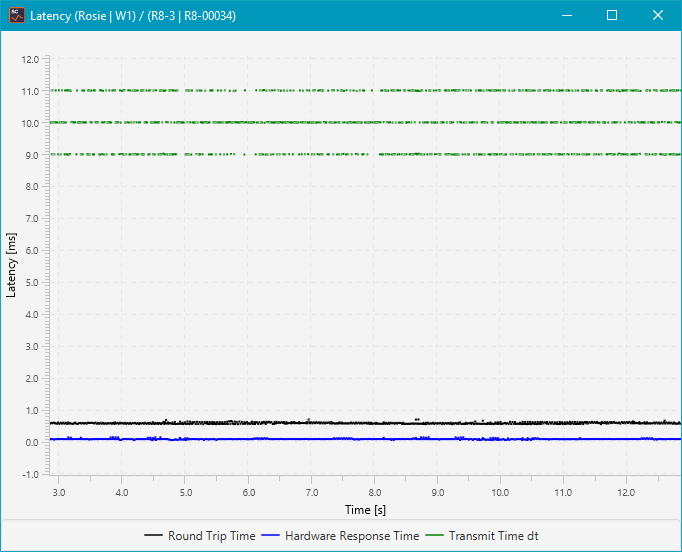 The image below shows a typical latency plot for a Windows 8 computer requesting feedback at 100Hz. The green dots represent the dt between received packets and provides information about the OS scheduler. The black dots represent the round-trip time of a packet going to and from a device. The Gains Tab provides a convenient way to change control strategies , set safety limits , and to set gains . Tips and guidelines on tuning gains can be found in the Motion Control documetation. Gains can be set while a device is actively being commanded, either by Scope or from any of the APIs, by clicking Send at any time. 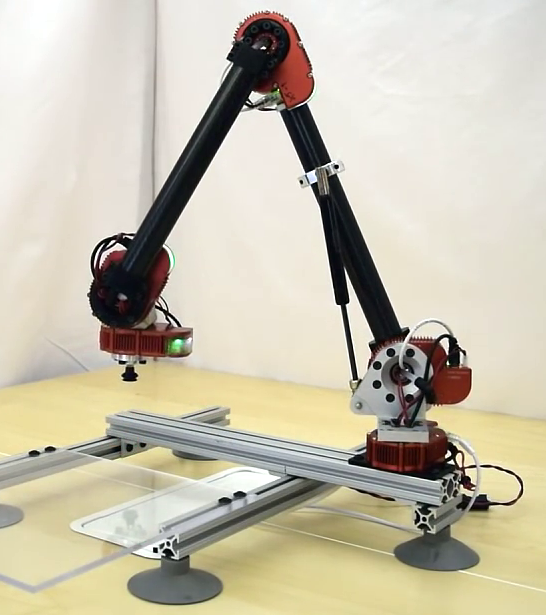 This allows easy online tuning of a robot’s motion. For example, you can generate commanded positions, velocities, and efforts for an actuator programmatically (e.g. 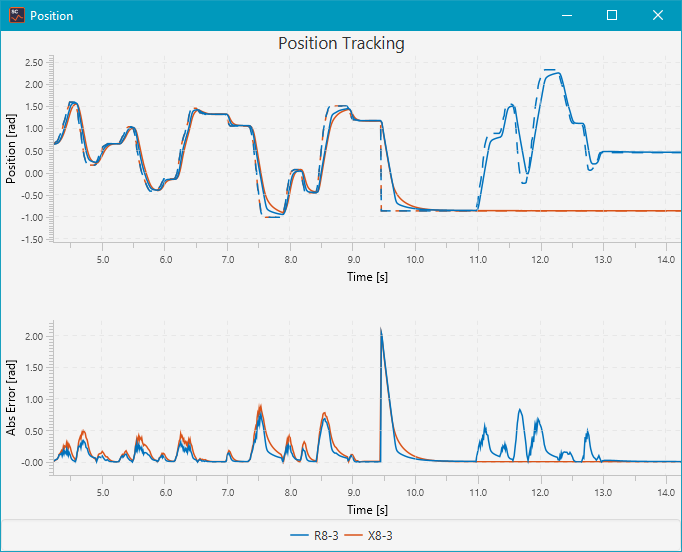 in MATLAB or C++) and use Scope to change the gains and plot the tracking performance online. If you are commanding from Scope you will need to make sure you are not also setting the control strategy (the dropdown box is blank). In this case the command will be cleared when sending gains. Sending gains will send all the fields shown. Empty fields will be ignored. You can clear the fields by clickin the Clear button . The default view of Gains show some of the most commonly adjusted parameters for the position, velocity, effort controllers on an actuator. The full list of parameters can be viewed by toggling the Show Advanced switch . Details on all of these parameters can be found in the Motion Control documentation. Gains are non-persisting parameters. This means that they will be reset to the last saved (persisted) values on reboot. To ensure that the current values are restored at next boot, you can enable the "Persist Sends" toggle or click persist on the Dashboard Tab. Gains can be saved in a group-compatible gain format by selecting one or more devices and pressing the save to file button . The gains of multiple devices will be stored in the same order as they appear on the device pane. Load file reads a gain file and loads the values into the corresponding input fields. Only one set of gains can be displayed at a single time. Send File loads the gains of an arbitrary number of modules and immediately sends them to the selected devices, without populating the input fields. The order will again match the order in the device pane. In many cases it is useful to reset or compare the active gains to the default values for an actuator. An easy way to do this is by using Load Defaults , which downloads the appropriate default gains for the selected hardware type and control strategy. Differences compared to the active gains are highlighted in yellow. Loading the default gains for a module requires an active internet connection. For cases that do not have access to the internet, we provide downloadable default gains that can be stored and loaded offline. 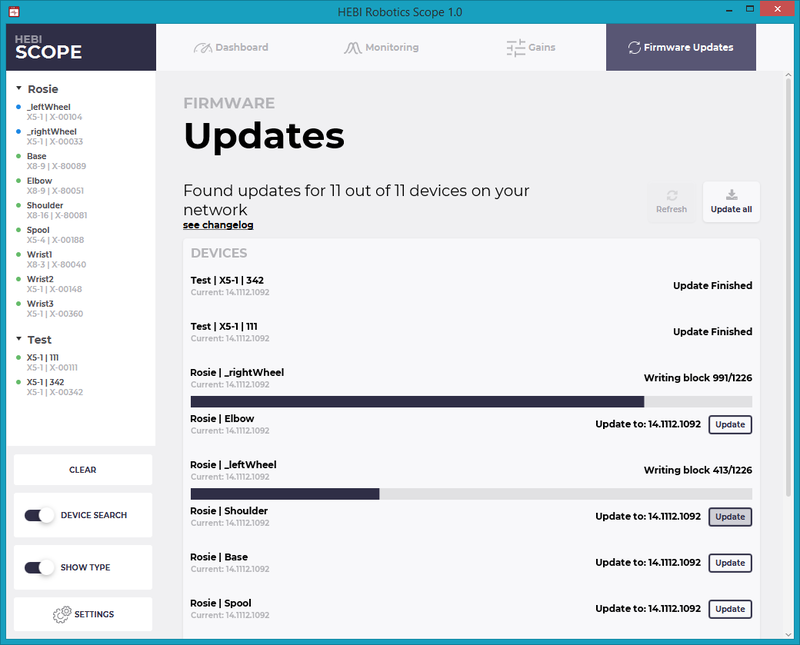 HEBI releases updates to the internal device firmware that contain performance improvements, additional features, and bugfixes. Each device has an isolated Bootloader mode, so updates can be done safely without the risk of disabling a module. You can check for updates using the Refresh button . Updating firmware requires an internet connection. We strive to maintain backwards and forwards compatibility in firmware udpates. In the rare cases where we do break backwards compatibility, we will send out email notifications to all customers. 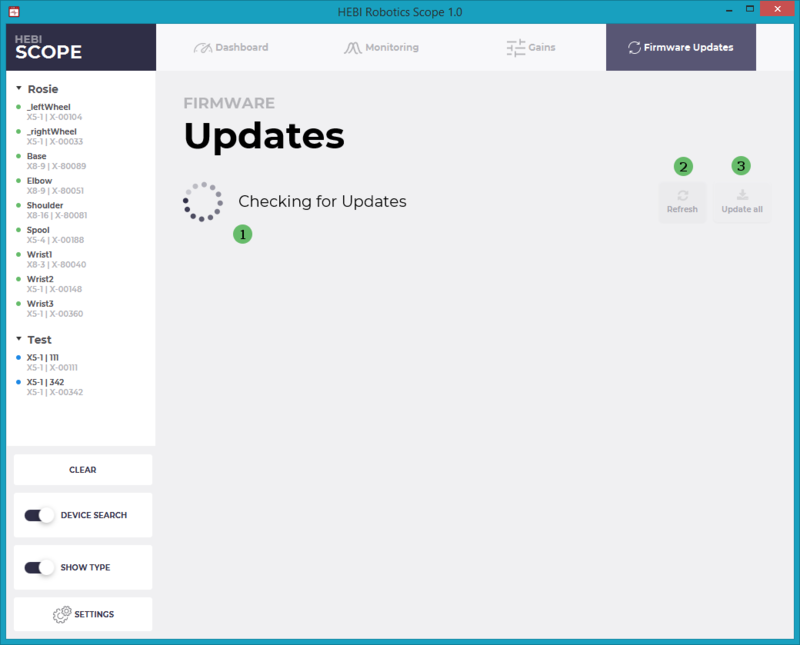 If you have any concerns about a firmware update, please check the Firmware Changelog or email us at support@hebirobotics.com. The refresh will show all modules for which updates are available . You can then update individual devices, or all of them at once . The devices will automatically reboot into Bootloader, download the appropriate application firmware, and reboot. Updating a device should take about 10 seconds. Cancelling or interrupting an update will not "brick" the module, but may require you to run the update process again. HEBI Mobile I/O is a free app for iOS and Android that provides a way of using a mobile device to generate general-purpose input/output in the HEBI APIs. Its main feature is a touch-screen interface that mimics a game-controller layout and provides digital and analog feedback in the same format that you would read from the HEBI I/O Board. The app also exposes internal sensors, including the mobile device’s IMU, magnetometer, GPS-based location data, and on compatible devices it provides the estimated 6-DoF pose of the device using ARKit in iOS and ARCore in Android. Make sure the mobile device is connected to your local network. In order to get pose feedback based on ARKit/ARCore, you will have to allow the app to access the device camera. This is because ARKit uses the camera to track features in the world to estimate the devices full 6-DoF pose. Access feedback from the mobile device in Scope or any of the APIs. In both Android and recent iOS versions, the name and family of the mobile device can be set using Scope by right-clicking the mobile device on the left side panel, or by setting the name and family from any of the APIs. There are also switches in the app to enable/disable GPS location feedback and ARCore pose feedback. 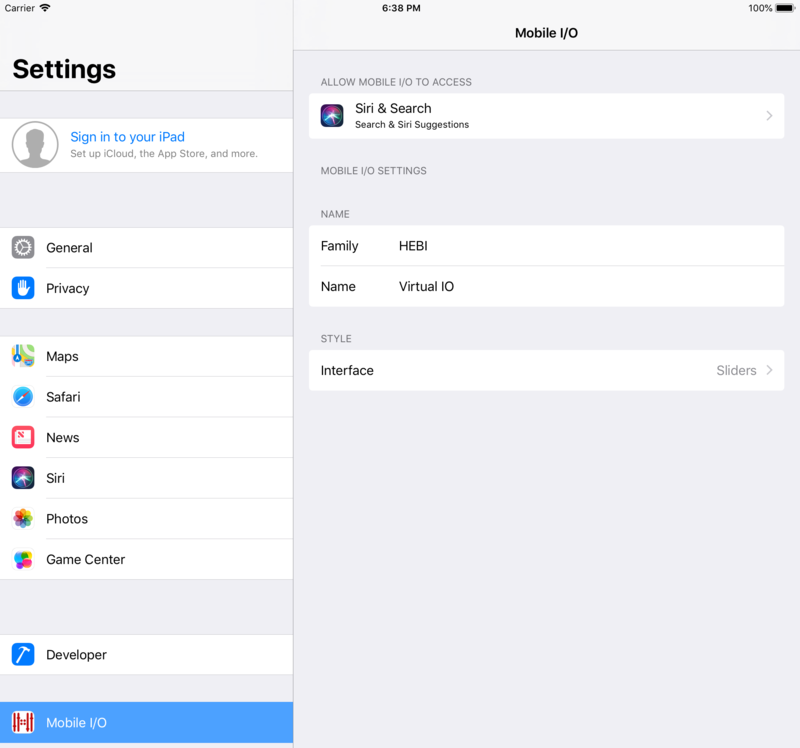 In iOS the name and family of the mobile device can be set in the settings panel for the app, found going to iOS Settings, and scrolling down the app list until you see Mobile I/O. This name and family will be how the device appears in Scope and the APIs. You can also change the layout of the iOS app to an alternative portrait Sliders view, instead of the default landscape Joystick layout. Finally, you can select whether or not the acceleration feedback that is returned from the application includes the acceleration due to gravity, or filters this information out. The joystick layout of the app provides 8 buttons and up to 8 analog sliders or joystick axes that you can use for input. The way the APIs communicate input from these buttons and axes are detailed in the table below. The buttons and axes are labeled on the screen. Note that the layout of the buttons and sliders may differ depending on the device. Overall, the API provides access to feedback from a mobile device the same way it does for other HEBI modules. Its main feature is a touch-screen interface that mimics a game-controller layout and provides digital and analog feedback in the same format that you would read from the HEBI I/O Board. 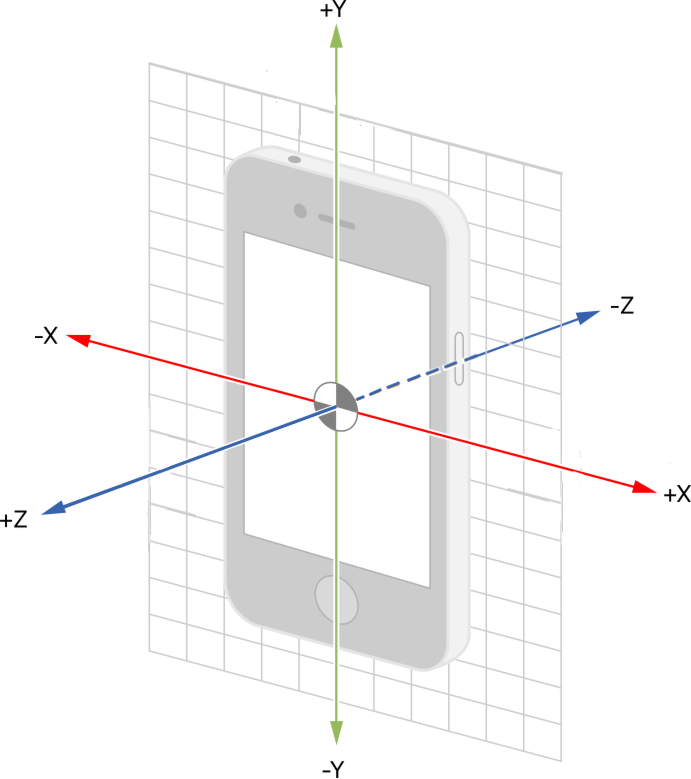 Where applicable, the reference frame for the feedback from the device follows the convention of the iOS Core Motion framework (see image below). The system time when feedback was received by the device. The most recent of these times is what is reported as the single time above. The system time when feedback requests were sent to the device. The hardware timestamp when the device transmitted its feedback. Time initializes at 0 when the app is launched. The hardware timestamp when the device received a request for feedback. Time initializes at 0 when the app is launched. 8 analog inputs based on touch input from joysticks or sliders in the app. 8 digital inputs based on touch input from buttons in the app. The system time when feedback was received by the decice. The most recent of these times is what is reported as the single time above. The device’s estimated linear 3-DoF acceleration from an internal IMU, excluding gravitional acceleration. Depending on the API, XYZ values are combined together into a single vector or returned individually. The device’s sensed 3-DoF angular velocity from an internal IMU. Depending on the API, XYZ values are combined together into a single vector or returned individually. The device’s sensed 3-DoF magnetic field from an internal magnetometer. Depending on the API, XYZ values are combined together into a single vector or returned individually. Altitude reported by the device barometer. Not yet supported. The device’s 3-DoF orientation, based on Core Motion in iOS and the equivalent motion sensor APIs in Android. Depending on the API, quaternion components are combined together into a single vector or returned individually. Latitude position on the surface of the earth, as reported by the device location services, which includes GPS. Currently Android only. Longitude position on the surface of the earth, as reported by the device location services, which includes GPS. Currently Android only. Altitude above sea level, as reported by the device location services, which includes GPS. Currently Android only. The bearing of the horizontal direction of travel of this device, based from true north. Currently Android only. The standard deviation of the uncertainty of the horizontal lat/long position of the device. Currently Android only. The standard deviation of the uncertainty of the vertical altitude of the device. Currently Android only. The GPS time when feedback was received for GPS-related feedback. Currently Android only. The device’s orientation in the world, based on ARKit / ARCore. Depending on the API, quaternion components are combined together into a single vector or returned individually. The device’s position in the world, based on ARKit / ARCore. Depending on the API, position components are combined together into a single vector or returned individually. Status of the tracking from ARKit / ARCore. The values listed here are used for Scope and the Matlab API. In other APIs they are an enum. Charge level of the device’s battery (in percent). The current user-settable name that a device shows up as in a Lookup. The current user-settable family that a device shows up as in a Lookup. A unique identifier of the device, displayed in the format of a MAC address. This is not the actual MAC address of the device. The network mask of the device. The gateway of the device. The unique identifier of the device provided by iOS. The class of device, e.g. iPad or iPhone X. The specific revision of the device, e.g. iPad6,11. The operating system of the device, e.g. iOS. The version of the operating system, e.g. 11.4.1. The Mobile I/O applications also can be configured by and display/react to commands sent from Scope or the APIs. Sets the "snap to" location for a joystick axis (default 0) or slider (default disabled). Sending nan disables the snap behavior. Sets the button behavior to momentary (default, 0) or toggle (1). The toggle state is identified by white text on the button, whereas the momentary state is black. Illuminates (1) or hides (0) a indicator ring around the corresponding button. If a joystick axis or slider is not in "snap" mode, and is not actively being moved, then this moves the joystick axis or slider to the given location. For joystick commands that are out of the unit circle range, this projects the desired point back to the unit circle. MATLAB is a proprietary scripting language and computing environment developed by Mathworks. It is widely used for data analysis and research across many engineering disciplines. The language’s focus on linear algebra and matrix operations makes it a very good language for programming robots. HEBI provides libraries that enable users to control complex systems in real-time directly from MATLAB. This allows for fast prototyping and testing of algorithms on real hardware, without the need for C/C++ or code generation. We currently do not officially support Simulink. However, we have done some preliminary work in this area. If you require need Simulink support, please contact us directly at support@hebirobotics.com. The HEBI API for MATLAB requires MATLAB R2013b or newer. First, download the latest Release and extract the contents into a directory of your choice. Then, open MATLAB and add the "hebi" directory to the search path. or programmatically by calling the built-in addpath function. For incorporating the HEBI library into a project, we recommend creating a startup script that can add the necessary files automatically. % startup sets up libraries and should be started once on startup. It is usually a good idea to increase MATLAB’s Java Heap Size using the slider control panel in Preferences→General→Java Heap Memory. In particular this will allow larger .hebilog files to be loaded into memory. The first call to HebiLookup initializes a background discovery process that can automatically discover modules using UDP broadcast messages. The default settings should be appropriate for most users, but may also be changed in hebi_config.m. Displaying HebiLookup provides an overview of all modules that are visible on the network. The Family and Name columns show the user-settable names, and the Serial Number column shows the unique serial number of each device. In case you need programmatic access to details (e.g. ip address, mac address, mechanical type, etc.) of all modules, you can use the group interface. Note that this can throw an error if modules are 'stale' (haven’t responded in several seconds) in which case stale modules would have to be cleared first. If for some reason modules are not listed, please refer to the following troubleshooting table. Check that your network does not block UDP broadcasts. If broadcasts are blocked (e.g. on the public CMU Wi-Fi network), individual IP addresses would need to be set manually via HebiLookup.setLookupAddresses(<ip>). We have encountered combinations of MATLAB’s 'clear' command in combination with loading multiple Java libraries that can cause the initialization code to not run. In such cases you can manually reset to the default values with the snippet below. If you encounter an issue connecting to modules that was not covered in the table above, please contact us directly. Modules that belong to the same system can be combined into a HebiGroup. Groups represent the basic way to send commands and retrieve feedback. They provide convenient ways to deal with modules, and handle high-level issues such as data synchronization and logging. Modules can be identified by user settable parameters, such as their name or family, or hardware constants, such as their serial number or mac address. The example names and serial numbers need to be modified to match devices that were found on your network during the discovery step. A comprehensive list of all available calls for selecting modules can be found in the HebiLookup API. Position, velocity, and effort (e.g. torque) can be commanded by using a CommandStruct. Each field expects a 1xN vector where N is the number of modules within a group. Leaving a field empty or setting a value within a vector to NaN corresponds to turning the corresponding control loop off. Commands are only valid for a limited CommandLifeTime, so even non-changing commands need to be re-sent before they expire. This safety measure may seem inconvenient at first, but it actually simplifies development due to the fact that motions automatically stop after halting a script (ctrl-c). Individual commands only set the low-level controller targets for the current instant in time, and do not calculate a trajectory from the current state to the desired target state. If you’d like to calculate a trajectory between two or more points, please take a look at the Trajectory API. The following example shows an open-loop controller commanding sine waves with different frequencies on two actuators using simultaneous position and velocity control. The IoCommandStruct serves as a similar structure to command the outputs on an I/O board. Note that for I/O boards we found it to be more maintainable to create a mapping and to access the individual pin fields by string as shown below. Each group continuously gathers sensor feedback from all contained modules in a background thread, and synchronizes the data into a single struct. 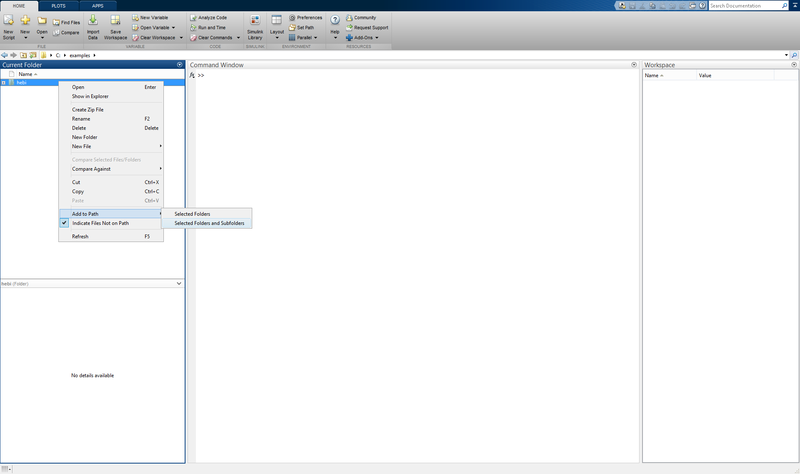 MATLAB can then asynchronously access the received feedback with getNextFeedback. Each call returns the next new (not previously accessed) synchronized feedback. Thus, a single feedback response will never be returned more than once. The default rate of 100Hz can be changed via setFeedbackFrequency or by modifying the hebi_config.m file. The actual feedback frequency is fundamentally limited by the underlying operating system’s scheduler. For example, code that executes at a rate of 1KHz in Linux may be limited to ~640Hz on Windows 7. For typical rates below 250Hz this tends to be irrelevant. The Importance of Metrics and Operating Systems contains more information about the expected performance for various operating systems. Feedback from multiple modules is typically synchronized to within 1ms. However, the actual timings depends on the network layout and external network traffic. Please see Analyzing the viability of Ethernet and UDP for robot control for more information. Our devices tend to return a large number of sensors, so we have added different 'views' in order to enable advanced use cases without confusing new users. The default view returns feedback of the most used types of sensors, but there are alternative views in case you’d like to access additional information such as hardware timestamp data. The below example shows a closed-loop controller that implements a virtual spring that controls effort (torque) to drive the output towards the origin (stiffness = 1 Nm / rad). While groups are completely independent of each other, there may be more than one group at a time, and multiple groups may be used together in any way. For example, the following code combines feedback from one group (gyroscope input) to calculate commands for a second group (velocity output). 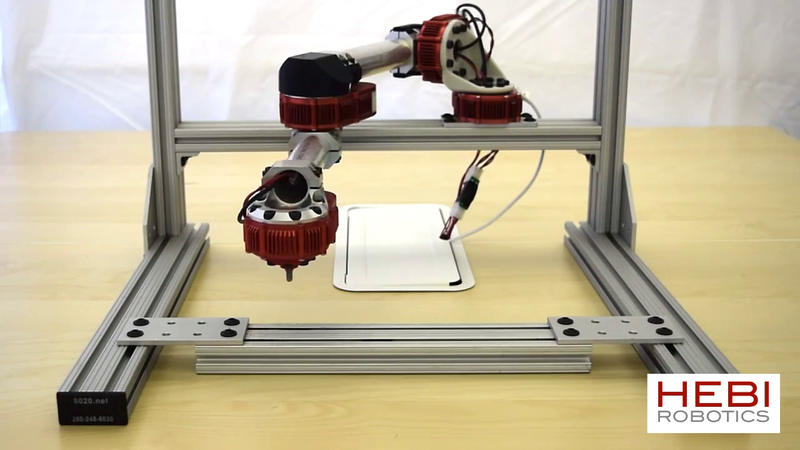 This is similar to the demo shown in Controlling Robots Using Android and MATLAB. Splitting a system into multiple groups often allows for a cleaner separation between the various elements, e.g., a 6-DoF arm (group 1) and a gripper (group 2). The send method additionally supports various other commands such as programmatically setting names, resetting modules, setting position limits, and setting LED colors. LEDs can for example be used to provide live feedback to people standing next to a robot, or for synchronizing/debugging motions in combination with a high-speed camera. The API has been developed with low-latency, and low memory usage in mind. For applications that require determinism or high control frequencies, we recommend the following additional steps. Decrease the frequency of minor garbage collections by increasing the new space in the java.opts file. Note that this is useful for applications that need to run for extended periods of time (e.g. days/weeks) and is overkill for 99.9% of applications. It may also negatively impact e.g. live plotting. The GainStruct can be used to change the gains of the control loops executed on each device. Gains are not automatically persisted and get reset after reboot. The following code forces a persist such that the gains are maintained during a reboot. Note that persist should not be called in a loop due to significant overhead on the device. Each call to send results in one outgoing message per module. Thus, all commands that are combined in a single call are guaranteed to arrive at a module at the same time. We have created the HebiKinematics API to assist with common robotics problems such as Forward Kinematics, Inverse Kinematics, Jacobians, as well as utilities for computing joint torques and forces. The addBody method creates a serial chain of bodies that describe the kinematic relation of a robot. A body can be a rigid link as well as a dynamic element. The first body represents the baseFrame and the last body represents the endEffector. Details about an existing configuration can be accessed at runtime using getBodyInfo for general body information, and getJointInfo for joint specific information. The Type argument specifies the type of module or body that should be added. The currently implemented types are listed in the sections below. Parameters that are not applicable to the specified type are ignored and will not throw an error message. Below are several sample configurations. The chain gets defined starting from the base module. Details on parameterized body types are in the Hardware section. For some cases it may be necessary to add custom machined or 3D printed parts. In order to accomodate such use cases we have added support for completely generic modules. Below code creates a generic joint with the same position and velocity limits as an 'S5-3' joint. Generic links can represent arbitrary static bodies. They are useful for specifying arbitrary end effector tools as well as custom connecting pieces. The getForwardKinematics method computes the poses of the chain of bodies in the base frame, using specified values for the joint parameters. Poses are returned as a set of [4 x 4 x numBodies] homogeneous transforms, specified in the world frame of the kinematic configuration. Units of XYZ translation are in [m]. The getJacobian method calculates the partial derivatives of the kinematics equation, which relates the joint rates to the linear and angular velocity of each body in the kinematics configuration. The Jacobian is returned as a [6 x numDoF x numBodies] set of matrices. Rows 1:3 of the Jacobian correspond to linear velocities [m/s] along the X-Y-Z axes in the world frame, while rows 4:6 correspond to rotational velocities [rad/s] about the X-Y-Z axes in the world frame. The call parameters are the same as for forward kinematics shown above. Dimensions with NaN get ignored, e.g., [x y NaN] for doing IK for a planar 2-DOF arm. Initial seed for the numerical optimization. Defaults to all zeros. Maximum allowed iterations of the numerical optimization before returning. The setPayload method provides a way to dynamically specify a payload that gets used for calculating efforts to compensate for gravitational effects and joint accelerations. Specifying a payload currently has no effect on any other functionality. The getGravCompEfforts method computes efforts (torques and forces) that are required to cancel out the forces on an arm caused by gravity. gravityVec = -[0 0 1]; % Direction of gravity. Does not need to be normalized. If you are not sure where gravity is coming from, an easy way to figure out the direction of gravity is to look at the accelerometer values of a fixed base module while the robot sits idle. The following example commands a 'weightless' gravity-compensated mode that allows users to touch a robot arm and move it around freely in space. This is often useful control mode for an operator to teach waypoints for teach-repeat applications. % built-in IMU (assumes fixed base). The getDynamicCompEfforts method computes the efforts (torques and forces) that are required to accelerate the body masses as determined from the specified positions, velocities, and accelerations. The 'Position' argument expects a vector of positions of all degrees of freedom, used for computing the Jacobian, where effort = J' * desiredForces. 'TargetPositions', 'TargetVelocities', and 'TargetAccelerations' typically come from some sort of trajectory generation function, such as the TrajectoryGenerator API below. 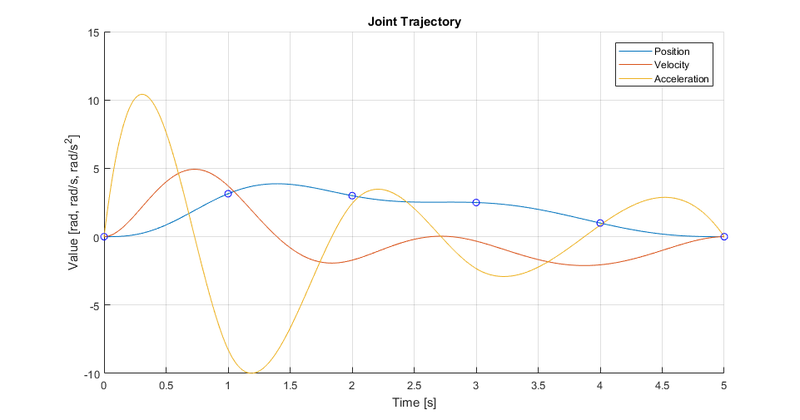 We provide trajectories via the HebiTrajectoryGenerator API to control a group of actuators in a manner similar to more traditional robot arms. 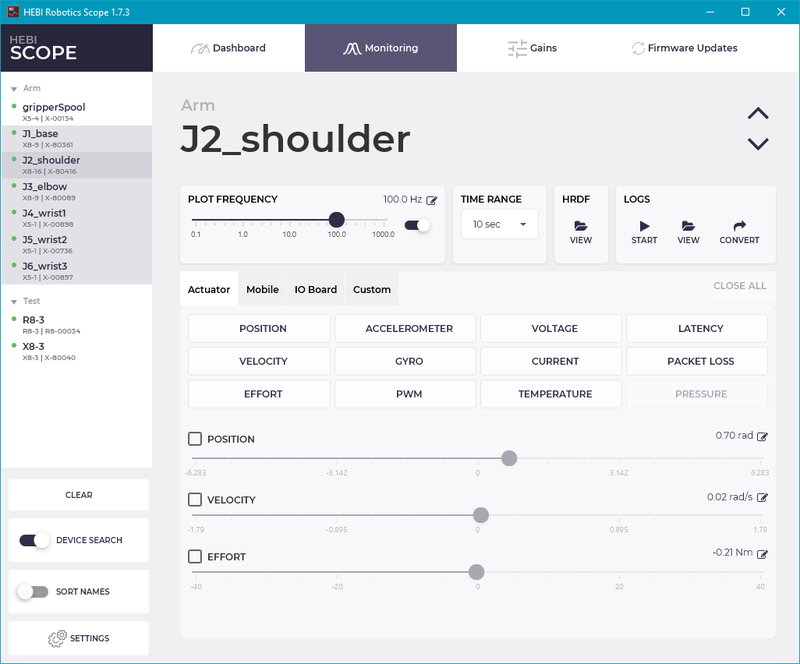 Features include parameterized minimum-jerk motion, and built-in gravity and dynamics compensation using the kinematics API. The moveJoint and moveLinear functions are simplified wrapper calls that respectively move joints in joint space, or such that the end effector path resembles a straight line in world coordinates. Both calls block until the motion is completed. The default settings use only position and velocity control. Effort control can be enabled with optional parameters. Gravity compensation or dynamics compensation should always be used together. Otherwise the target efforts may be too low and interfere with position/velocity control, which depending on the control strategy could make the performance worse. Using these wrapper calls is equivalent to creating a non-blocking trajectory and calling the blocking executeTrajectory function. If you need access to more advanced trajectory options, you can manually split the calls up as shown below. There are many use cases for which it is important to dynamically react to changes in the environment such as hitting unforeseen obstacles or when following a moving target. This can be done by creating a trajectory (newJointMove or (newLinearMove) and executing it manually. can be found in the API documentation for HebiTrajectoryGenerator and newJointMove. The following code creates a sample trajectory between 6 position waypoints for a single actuator. The resulting trajectory can be visualized using standard MATLAB plots as shown below. Data logging, visualization, and analysis tools are a critical part of robotics development. We provide powerful logging capabilities that allow the logging of data in excess of 1kHz, from any number of modules, and over extended periods of time (multiple days). Logging is done entirely outside of the main MATLAB thread, written directly to disk, so that there is no performance impact on real-time control. This also means that in case MATLAB ever crashes due to unforeseen circumstances, none of the logged data is ever lost. The logging format is also common across all HEBI APIs, so logs saved with by one API can read by any of the other APIs. Logs are returned as structures where data is organized in vectors and matrices so that the resulting data interacts well with MATLAB’s built-in plotting tools. The default stopLog call returns a Java object that contains all the data. Thus, each access needs to convert the underlying Java type to the corresponding MATLAB type. This is typically not an issue, but if you need to access fields many times, we recommend converting the Java object to a MATLAB struct via struct(data). All logging happens in the background and gets stored on disk in a binary streaming format. The default stopLog() call converts the binary format into another format that MATLAB can work with. We also provide the convertGroupLog() utility to load raw log files that were previously saved or generated using other APIs. The same utility also useful for splitting logs into e.g. 1 hour chunks in a long running process. The conversion would be too expensive to do inside a loop, so instead we can call startLog to finish the previous log and to start a new one. This is comparatively very cheap and may be called inside a tight loop. The resulting log files can then be loaded once a task is done, or from a different MATLAB instance while the task is still running. We also added the newGroupFromLog utility which supports replaying log files via the standard group interface. After loading the log, each call to getNextFeedback on the group returns the next feedback in sequence (including the logged timestamp), regardless of the rate it is actually being called. This is useful, for example, for online algorithm development while working with offline data. Examples for the Python API can be found on our GitHub account. The latest version of the API reference can be found here. This guide also provides many hyperlinks to the API reference where relevant. The examples are divided into a few folders: basic, advanced, and kits. The basic examples are designed as a hands-on tutorial for getting started with the API; we highly recommend downloading and going through these examples as concrete/runnable examples of the concepts discussed in this documentation. The HEBI Python API is available through PyPI, which requires the use of pip. The API requires numpy, which is available on practically any platform Python is supported. For some functions in the hebi.util module, matplotlib is required; however, matplotlib is not a hard requirement since it may not be available on machines without a graphical user interface (e.g., a Linux machine without an X server). It is recommended to install matplotlib through your package managers on most Linux distros. Matplotlib’s website documentation elaborates more on specific dependencies and how to compile from source. The GitHub examples repository provides the SDL2 library for Windows users. It is automatically loaded when necessary on Windows, but not for Linux and MacOS. Linux and MacOS users must install it themselves. Debian/Ubuntu users can install it using sudo apt-get install libsdl2-2.0-0 and Fedora/RHEL users can install it using sudo [yum|dnf] install SDL2. Most modern IDEs (e.g., PyCharm) have pip integration by default. You can use the provided facilities to find the hebi-py package and install it. Some Linux distributions prefer you to install numpy through their package manager. For example, Ubuntu prefers for you to use python-numpy or python3-numpy for numpy. Fedora prefers python2-numpy or python3-numpy. For some Linux environments, you may not be able to easily install matplotlib because you do not have a desktop environment (e.g., running a server Linux install on a Raspberry Pi). For such environments, you cannot use the plotting functions under hebi.util, but the rest of the API will not be affected. The Python API provides an easy to use facility to discover and communicate with HEBI modules on network interfaces. All discovery will occur through the The Lookup class. 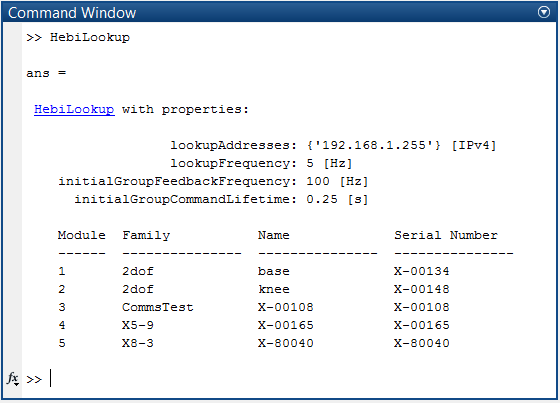 The Lookup class manages a background discovery process that can find modules on the local network using UDP broadcast messages. This class acts as a singleton and can be disposed of after creating the desired The Group objects. To view the modules that have been discovered, use the EntryList class to programmatically access the contents at a snapshot in time. A Lookup object can create a Group instance. A group is a collection of modules (often part of the same robotic system), and the group interface represents the basic way to send commands and retrieve feedback. They provide convenient ways to deal with modules and handle high-level issues such as data synchronization and logging. Modules can be identified by user settable parameters, such as name or family, or hardware constants, such as their mac address. The Lookup class documentation provides a comprehensive set of functions used to create group objects. Position, velocity, effort, and many other fields can be commanded by using the Command API. A GroupCommand object is used to store the commands to be sent to the group. We use types from the numpy library to update many of the fields with vectors of data. # numpy is aliased to np throughout this documentation. Setting the values in the GroupCommand object does not affect/command any modules until the command is sent to the group with the http://docs.hebi.us/docs/python/1.0.1/hebi/py_api.html#hebi.internal.group.Group.send_command[Group.send_command] function. Also note that commands can be dropped on particularly poor or congested networks, and the function does not provide guaranteed delivery or even an acknowledgement; it is designed for relatively high-frequency applications where commands are resent frequently (_e.g., 100Hz). For commands that are only sent once (such as setting gains on the modules), we recommend usage of Group.send_command_with_acknowledgement to verify that the command was received. The command affects the actuator control loops only if at least one of the position, velocity, and effort command fields is not cleared. In particular, a command sent with all three of these cleared will not affect the control loop setpoints. However, if only a subset of the fields are set (e.g., only position), then commands from the other fields will be cancelled when this message is receieved. Individual commands only set the low-level controller targets for the current instant in time, and do not calculate a trajectory from the current state to the desired target state. In other words, setting a single position command will result in a step response from the actuator. If you’d like a smooth motion between two or more positions, please take a look at the trajectory API. Commands are only valid for a limited command lifetime, so even unchanging setpoints need to be re-sent before they expire. When set, this means that is a process is killed (e.g., with ctrl-c), commanded motions are aborted. This is set on a per-group basis with the Group.command_lifetime field. By default, the command lifetime is 100ms. # Command must be sent in loop at a faster rate than the lifetime in order to remain in effect. Note in addition to actuator commands such as position, velocity, and effort, the Command object can be used to set values for other types of modules. Here, we set the value on an I/O board digital output pin to 'high'. A group is responsible for gathering sensor feedback from all contained modules, and synchronizing these into a single GroupFeedback structure. By setting the group’s feedback frequency (set Group.feedback_frequency), a background thread will request and synchronize this feedback at a specified rate. The default feedback rate is 100Hz. # ... read/use feedback object contents here. 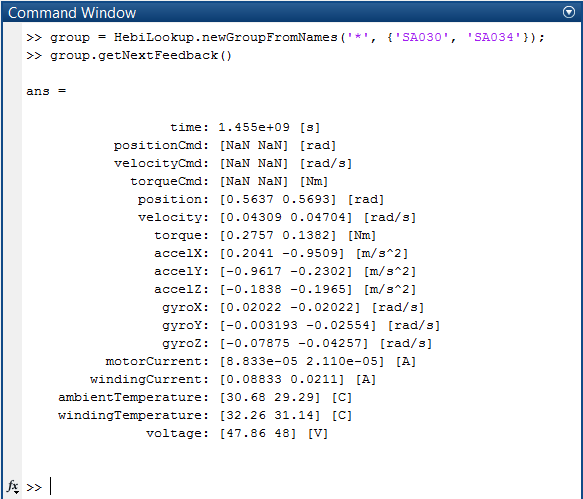 This use of Group.get_next_feedback parallels the approach taken in the HEBI API for MATLAB. You can also retrieve feedback when the feedback frequency is zero by manually sending a feedback request. This allows finer grained control over the network traffic that is sent. Setting the feedback frequency through the feedback_frequency field effectively calls the send_feedback_request function at a certain rate on a background thread. The GroupFeedback object contains position, velocity, and effort actuator feedback, as well as sensor feedback from a number of sensors. Similar to commands, many of the values can be accessed as numpy vectors or matrices, with one row for each module in the group. The below example shows a closed-loop controller that implements a virtual spring that controls torque to drive the output towards the origin (stiffness = 1 Nm / rad). The API has been developed with low latency and high efficiency in mind. For applications that require high control frequencies, we recommend the following additional steps. 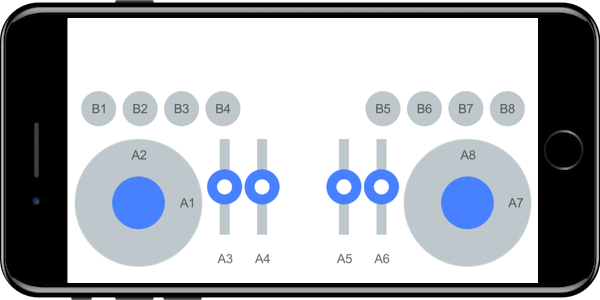 Control loop gains can be retrieved and set on each device by features provided by the Command and Info APIs. The recommended way to set and load gains is to use the XML gain format that works across HEBI APIs and GUI tools. Alternatively, individual gains can be accessed and set programmatically. You will see that there are associated gains fields within both the GroupCommand and GroupInfo classes. The hebi.robot_model module contains classes and functions to store and work with robot kinematic configurations. These assist with computing forward and inverse kinematics and Jacobians. The robot_model.RobotModel class is used to store how different rigid bodies and joints are attached together. There are helper functions to add standard HEBI components to the robot model. The first body added to the RobotModel object represents the base and the last body represents the end (often an end effector) of the kinematic chain. Currently the API assumes a serial kinematic chain of bodies. Support for kinematic trees is planned in a future release. The complete list of these methods is documented here. These methods and their named parameters correspond with the actuator, link, and bracket types given in the Kinematic Body Types section. In addition to standard HEBI components, you can use the RobotModel.add_rigid_body and RobotModel.add_joint functions to add any desired masses and degrees of freedom to your system. The get_forward_kinematics method computes the poses of each body in the RobotModel object, using specified values for the joint parameters. Using the frame_type parameter, one can choose either the center of mass or the output frame for each kinematic body. The resulting 4x4 homogeneous transforms are specified in the world frame of the RobotModel object. This world frame defaults to the input frame of the base module, although a transformation can be prepended using the base_frame field. Units of translation are in meters. # First, build up a hebi.robot_model.RobotModel object, as in previous examples. We can also use the RobotModel object to obtain the Jacobian, or the partial derivatives of the forward kinematics equation. This relates the joint velocities to the linear and angular velocity of each body in the system. The Jacobian in returned as a set of matrices, one for each body in the RobotModel object. Each matrix is of size 6 x numDoF. Rows 1 - 3 of this matrix corresponds to this body’s linear velocities [m/s] along the X-Y-Z axes in the world frame, while rows 4 - 6 correspond to rotational velocities [rad/s] about the X-Y-Z axes in the world frame. The columns define the contributions to these linear and rotational velocities that would be a result of the respective degree of freedom instantaneously moving at unit velocity (e.g., a rotational joint being driven at 1 rad/s). As with the forward kinematics, we provide versions for the end effector (which just returns a since 6 x numDoF matrix) as well as the entire system. Full API documentation of these functions is available here. The RobotModel object also provides a method for computing joint angles that solve the inverse kinematics, according to a number of objectives and constraints. Note that the implementation of this function relies on a local optimization, and so is highly dependent on the initial joint angles that are provided as the seed for the search. The desired objectives and constraints should be passed to the RobotModel.solve_inverse_kinematics function as a series of arguments - any number are permitted, but there are limitations in which can be used together. # Fill in 'initial joint angles', perhaps with feedback from the robot. Currently, computation of torques for gravity compensation is not supported directly in the API, but our examples repository provides a utility function and examples for adding this into your own system. This is subject to change and inclusion directly in the API in the future. This example in c++ demonstrates sending torques to compensate for the effect of gravity for a 3 DOF arm. A trajectory is a (smooth) motion through two or more waypoints (a waypoint is a specific joint positions for each module in the robot). A trajectory defines the position, velocity, and acceleration for each module at each point in time, from the start to end of the trajectory. More traditional robot arms usually are controlled by defining waypoints and some motion parameters (e.g., maximum acceleration), as opposed to the joint-level control our API provides at the lowest level. The trajectory API provides a way to define motions in a similar high-level way as these traditional systems, while still allowing access to control and feedback at a lower level. The Trajectory class is used to generate and access trajectory motions. To create a trajectory object, you must define the waypoints and time at which the robot should pass through each waypoints. Note that the waypoint velocity and acceleration constraints are optional, but it is often useful to at least define the starting and ending velocity and acceleration to be zero. If these are not given, it is left up to the internal implementation to determine values for these. # Position, velocity, and acceleration waypoints. # Each column is a separate waypoint. # Each row is a different joint. Note that acceleration can not be (meaningfully) directly sent to the actuator, but with knowledge of the dynamics this can be converted to a torque or force to compensate for this acceleration. For improved control, we recommend adding effort commands that are the summation of torques/forces that compensate for gravity and torques/forces that compensate for this acceleration. Data logging, visualization, and analysis tools are a critical part of robotics development. Our logging capabilities allow logging of data from groups of modules in excess of 1kHz, and over extended periods of time (multiple days). Logging is done on a background thread so there is no impact on the control logic, and logging easy to enable/disable, even in complex existing code. The logging format is common across all HEBI APIs, so logs saved with one API can be read by any other API. Here is a simple example of logging data. The logging occurs at the group’s feedback frequency. The log data is stored in a file on disk. The name is returned with the initial Group.start_log call, and is also retrievable through the LogFile object returned when stopping the log. # If we are trying to find the max, start with the lowest possible number. Also available are earlier versions of the API and Doxygen documentation. The examples are divided into two folders: basic and advanced. The basic examples are designed as a hands-on tutorial for getting started with the API; we highly recommend downloading and going through these examples as concrete/runnable examples of the concepts discussed in this documentation. The .cpp and .hpp files that comprise the source code of the C++ wrapper around the underlying C library. The hebi.h header file that provides the function declarations for the underlying C library. The actual dynamic/shared object library that must be linked into your program (.dll for Windows, .so for Linux, and .dylib for macOS). The C++ API is designed to be used with the C++ 11 standard; when building your project, ensure you have set the proper compiler switches to enable this support (e.g., -std=c++11 for gcc). If you are using Visual Studio, use the NuGet package manager to add the HEBI C++ API as a dependency. You will have to disable "precompiled header" support for the API to properly compile with your project. Use the examples as a template for setting up a CMake or Visual Studio project dependent on the C++ API. Add the source .cpp files to your project sources, ensure your include path contains the .hpp and hebi.h file, and link in the shared object for your platform and architecture. The hebi::Lookup class manages a background discovery process that can find modules on the local network using UDP broadcast messages. Generally, you will only need one hebi::Lookup object per application, and it can be disposed of after creating the desired hebi::Group objects (see Module Selection). To view the modules that the Lookup has discovered, use the hebi::LookupEntry class to programmatically access the contents at a snapshot in time. A Lookup class can create a hebi::Group instance. A group is a collection of modules (often part of the same robotic system), and the group interface represents the basic way to send commands and retrieve feedback. They provide convenient ways to deal with modules and handle high-level issues such as data synchronization and logging. Modules can be identified by user settable parameters, such as name or family, or hardware constants, such as their mac address. Position, velocity, effort, and many other fields can be commanded by using the Command API. A hebi::GroupCommand object is used to store the commands to be sent to the group. We use types from the open-source C++ matrix library Eigen to update many of the fields with vectors of data. Setting the values in the GroupCommand object does not affect/command any modules until the command is sent to the group with the Group::sendCommand function. Also note that commands can be dropped on particularly poor or congested networks, and the Group::sendCommand function does not provide guaranteed delivery or even an acknowledgement; it is designed for relatively high-frequency applications where commands are resent frequently (e.g. 100Hz). For commands that are only sent once (such as setting gains on the modules), we recommend usage of Group::sendCommandWithAcknowledgement to verify the command was received. The command affects the actuator control loops only if at least one of the position, velocity, and effort command fields is not cleared. In particular, a command sent with all three of these cleared will not affect the control loop setpoints. However, if only a subset of the fields are set (e.g., only position), then commands from the other fields will be cancelled when this message is receieved. If you want to completely cancel out a previous command (especially when the Command Lifetime is not set!) and turn the control loops off, you can set the commanded value to NAN (see std::numeric_limits::quiet_NaN). The Command class documentation provides complete documentation of the Command class fields. Commands are only valid for a limited command lifetime, so even unchanging setpoints need to be re-sent before they expire. When set, this means that is a process is killed (e.g., with ctrl-c), commanded motions are aborted. This is set on a per-group basis with the hebi::Group::setCommandLifetimeMs() function. By default, the command lifetime is 100ms. Note that this function will return 'false' if attempting to set a value longer than the maximum allowable command lifetime. // Command must be sent in loop at a faster rate than the lifetime in order to remain in effect. // It is good practice not to allocate this every loop iteration. A group is responsible for gathering sensor feedback from all contained modules, and synchronizing these into a single Group Feedback structure. By setting the group’s feedback frequency (using Group::setFeedbackFrequencyHz), a background thread will request and synchronize this feedback at a specified rate. The default feedback rate is 100Hz. // ... read/use feedback object contents here. This use of getNextFeedback parallels the approach taken in the HEBI API for MATLAB. The setFeedbackFrequencyHz call effectively calls the sendFeedbackRequest function at a certain rate on a background thread. The GroupFeedback object contains position, velocity, and effort actuator feedback, as well as sensor feedback from a number of sensors. Similar to commands, many of the values can be accessed as Eigen vectors or matrices, with one row for each module in the group. Fields can also be accessed via individual hebi::Feedback object references, which allow hierarchical access to all information contained in the feedback message. The hebi::RobotModel namespace contains classes and functions to store and work with robot kinematic configurations. These assist with computing forward and inverse kinematics and Jacobians. The hebi::robot_model::RobotModel class is used to store how different rigid bodies and joints are attached together. There are helper functions to add standard HEBI components to the robot model. The first body added to the hebi::robot_model::RobotModel object represents the base and the last body represents the end (often an end effector) of the kinematic chain. In addition to standard HEBI components, you can use the addRigidBody and addJoint functions to add any desired masses and degrees of freedom to your system. The RobotModel::getForwardKinematics (or aliased RobotModel::getFK) method computes the poses of each body in the RobotModel object, using specified values for the joint parameters. Using the HebiFrameType parameter, one can choose either the center of mass or the output frame for each kinematic body. The resulting 4x4 homogeneous transforms are specified in the world frame of the RobotModel object. This world frame defaults to the input frame of the base module, although a transformation can be prepended using the setBaseFrame function. Units of translation are in meters. // First, build up a robot_model::RobotModel object, as in previous examples. As with the forward kinematics, we provide versions for the end effector (which just returns a since 6 x numDoF matrix) as well as the entire system. Note that the matrices are now of type Eigen::MatrixXd and MatrixXdVector. The RobotModel object also provides a method for computing joint angles that solve the inverse kinematics, according to a number of objectives and constraints. Note that the implementation of this function relies on a local optimization, and so is highly dependent on the initial joint angles that are provided as the seed for the search. The desired objectives and constraints should be passed to the solveIK function as a series of arguments; any number are permitted, but there are limitations in which can be used together. In future API releases, the IKResult return structure will contain more information about the optimization result. // Fill in 'initial joint angles', perhaps with feedback from the robot. Currently, computation of torques for gravity compensation is not supported directly in the API, but our examples repository provides a utility function and examples for adding this into your own system. This is subject to change and inclusion directly in the API in the future. This example demonstrates sending torques to compensate for the effect of gravity for a 3 DOF arm; a simplified version is reproduced below. // Retrieve masses from robot model for efficient/convenient access later. The hebi::trajectory::Trajectory class is used to generate and access trajectory motions. To create a trajectory object, you must define the waypoints and time at which the robot should pass through each waypoints. Note that the waypoint velocity and acceleration constraints are optional, but it is often useful to at least define the starting and ending velocity and acceleration to be zero. If these are not given, it is left up to the internal implementation to determine values for these. // waypoint; each row is a different joint. // Pass "nullptr" in to ignore a term. Note that acceleration can not be (meaningfully) directly sent to the actuator, but with knowledge of the dynamics this can be converted to a torque or force to compensate for this acceleration. For improved control, we recommend adding effort commands that are the summation of torques/forces that compensate for gravity and torques/forces that compensate for this acceleration (an example of this is coming soon). Here is a simple example of logging data; the logging occurs at the group’s feedback frequency. The log data is stored in a file on disk; the name is returned with the initial "startLog" call, and is also retrievable through the LogFile object returned when stopping the log. Note that is the "stopLog" call returns an empty shared_ptr object, this indicates that the call failed and the log file was not created; this is usually caused by there being no active log that has been started. // If we are trying to find the max, start with the lowest possible number. HEBI products can be used with ROS in a number of different ways depending on the project needs, and so we have provided examples of different approaches that might work best for you. C++ API - Calling the HEBI C++ API directly in your node, allowing you to access higher-level API functions. In general, ROS is a terrific ecosystem for connecting functional components such as planners, robotic arms, etc. We have found that extending this to a hardware interface at the level of individual modular actuators rather than robotics systems (such as an arm) has benefits and drawbacks. It can help you get started quickly (e.g., you only have to send ROS messages), but can be somewhat limiting (doing tight control loops that involve coordinating commands and feedback to several modules is difficult). For this "direct interface" approach, we have created the hebiros node, documented at http://wiki.ros.org/hebiros. This API provides a very similar API to that of the MATLAB, Python, or C++ APIs, but abstracts function calls to ROS messages and actions. 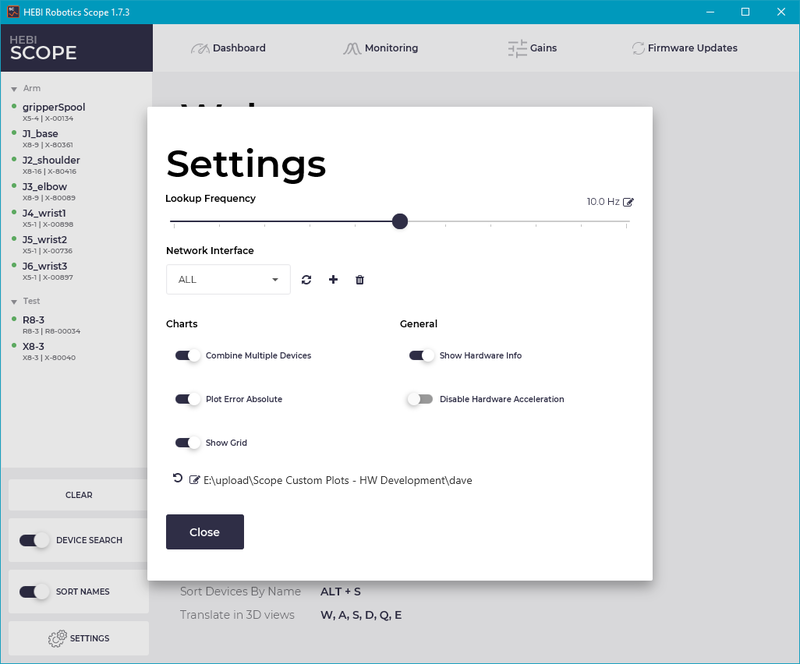 This API also supports importing URDF files, and changing a startup flag to simulating the underlying system with gazebo rather than connect to physical hardware. The "basic examples" demonstrate usage of this API for sending commands to and receiving feedback from the modules. These basic examples can be compiled and run using the C++ source, or you can use rostopic pub to send the messages from the command line after starting the hebiros node. This is currently supported on ROS kinetic. We also provide a library of XACRO macros in the hebiros_description package to help you build up systems from HEBI components quickly. Alternatively, instead of using ROS messages and actions to wrap the C++ API calls, we also provide a hebi_cpp_api package that provides access to the HEBI C++ API directly in your package, without having to manage the associated source files. This is available at http://wiki.ros.org/hebi_cpp_api. Using this approach, you can access many of the higher-level features of the C++ API — creating smooth trajectory objects and querying them rather than just sending them to a module, interfacing with forward and inverse kinematics, etc. This is currently supported on ROS kinetic and melodic. This latter approach has formed the basis of many of our larger examples for ROS, including arm examples, mobile base examples, and hexapod examples. As the ROS support has grown and changed, we have found our repository and code layout need to be updated as well. The code is currently undergoing a large refactor and organization reorganization; please pardon the mess while we clean this up! The code for the hebiros node and associated packages is at http://github.com/HebiRobotics/HEBI-ROS/. Examples of using the hebi_cpp_api are provided at http://github.com/HebiRobotics/hebi_cpp_api_ros_examples. These examples include system-level demonstrations, e.g. an "omnibase" node and an "arm" node. These nodes provide higher-level interfaces, such as cartesian-space arm control. One notable branch of the HEBI-ROS repo is the iamtesch/ROSie branch, which contains a demonstration of our Rosie kit using a camera to locate colored bean bags, which it will then pick up (this is being migrated to the hebi_cpp_api_ros_examples repo). The C# API currently is in development. Documentation will be coming soon. In addition to direct programmatic access to setting controller gains, gains can also be stored in a XML file format that is universal to the HEBI APIs and Scope. This format allows gains to be loaded from a file and sent to a group of modules, or saved from a group of modules to a file. Saving the gains from a module or group of modules will capture all of the settable parameters, including the control strategy. This format supports all available gains for the position, velocity, and effort controllers, as can be seen in our downloadable default gains. Scope, as well as the C, C++, Python, and MATLAB APIs all have tools to read and write this gain format. Note that in each case below the gains will be set on the module, but not "persisted" to internal memory so that they apply on the next reboot of the module. Remember to 'persist' these gains if desired! In the Scope GUI, the currently active gains can be saved to a file by using the "Save to File" button (1) on the "Gains" tab, and the gains in a file can be written to a module by using the "Load File" button (2). The "Load Defaults" button (3) loads the default gains for the selected module and control strategy. Differences between the input fields and the currently set values will be highlighted. In the C++ API, these gains can be saved and loaded by using the following code, assuming you have created a Group (see C++ documentation for more info). In addition to direct programmatic and UI access to setting safety parameters such as position limits, m-stop strategies, etc, these can also be stored in a XML file format that is universal to the HEBI APIs and Scope. This format allows safety parameter to be loaded from a file and sent to a group of modules, or saved from a group of modules to a file. Currently, this is only supported by the MATLAB API, but will be added to the C++ and Python APIs in upcoming releases. This format is fully documented here. The MATLAB API is currently the only API supporting reading and writing this format. Note that in each case below the parameters will be set on the module, but not "persisted" to internal memory so that they apply on the next reboot of the module. Remember to 'persist' these gains if desired! 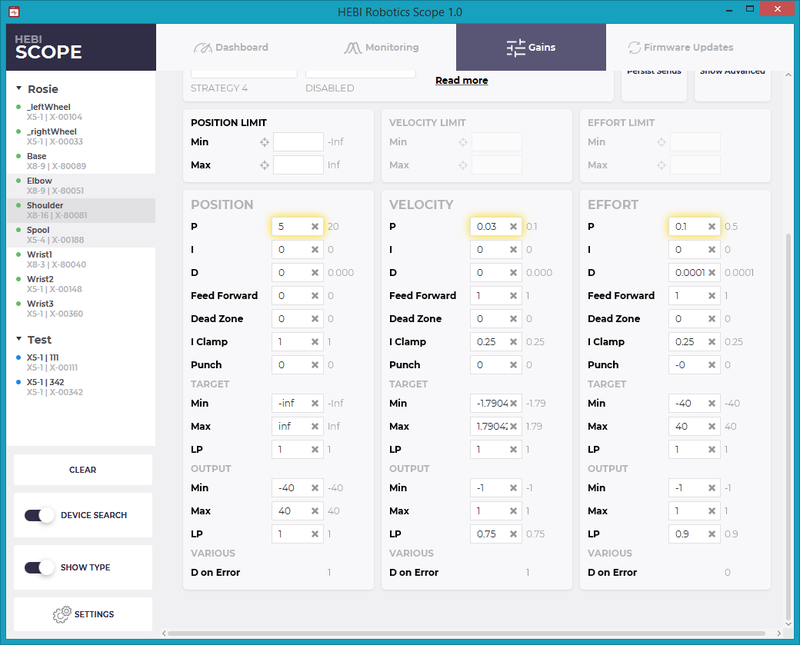 The HEBI Robot Description Format (HRDF) is an XML-based format that allows kinematics and dynamics information about a robot configuration to be stored as a file that can be used by a variety of tools. The complete format, including past versions and example files using this format, is documented at http://github.com/HebiRobotics/hebi-kit-xml/. This format supports standard HEBI components, as well as generic rigid bodies and massless joints. As new components are added or new features supported by the URDF format, the version number of the format is incremented increased. Each API version explicitly supports a given version of the format. Version 1.0.0 of the format supports the following elements. Note the attributes correspond to the documented parameters of the HEBI components. The rotation matrix describing the orientation of the center of mass relative to the input. This is used for simplifying the inertia tensor description if desired. The rotational or translational degree of freedom about a principal coordinate axis.